Denny Jump (Bellevue, WA, United States) on 25 July 2011 in Landscape & Rural. 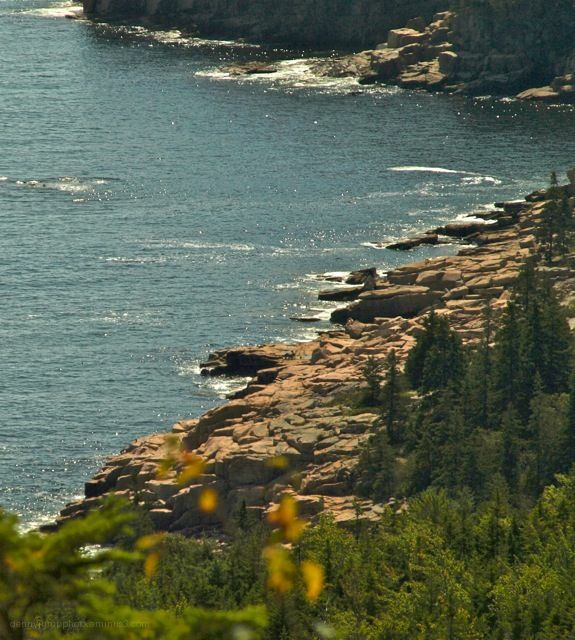 Continuing with our "Sunglass Tour," we see some of rocky coastline of Acadia National Park. Ice age glaciers and shifting of the earth are primarily responsible, as always. But it was just an amazing experience, to me, to sit and gaze upon the rocks and think of the times that have passed by. All of the waves and winters and seasons that transpired while the rocks remained firm. To me. putting things into perspective is what Acadia is all about, in oh, so many ways. Superb point of view, Denny - the warm light is magnificent! Superb capture of this lovely scene. Really nice composition Denny. I like the shapes of land & water you've created here. It has an interesting enclosed feeling while knowing that a wide shot would probably show a vast vista of sea & shore. @Eric Cousineau: Hi Eric - Thank you very much. I really appreciate it. Oh, I'd love to go hopping along that rocky coastline - nice shot, Denny! @Ralph Jones: Hi Ralph..Thank you very much sir! Beautiful view, love the pines -- so refreshing, great capture! @RBL: HI Ruthie ..thanks very much -I LOVE your image today..too cute! These images of Acadia National Park are just so special! I have always wanted to see it, and now I want to go even more! @Tracy: I highly recomment it, Tracy...you would come away with some award winners I know!! Take your boots though..the trails are often rocky back here in the east! @john4jack: Thank you Jack -yes it is really beautiful...we really want to get back there soon! Beautiful coastline! I spent some time in Nova Scotia and the coastline there is very similar. I love watching the water crash onto the rocks. So much energy and power. Wow, this is great. It has such a soaring feeling. You must have been. Your composition captures the vastness of these rocks beautifully. I love how you much get into nature and photograph. Rarely a chance for me. I just study the wilds of civilization. THis is just beautiful. A great PoV captured here which illustrates the flatness of these rocks which seem to create natural terraces. Nice textures captured in the pines as well. Nice job of framing this, to get that pleasing triangle of water to rugged shoreline. I also love the light hitting those rocks. Looking forward to catching up with you over the next few days! If only each of those rocks could tell their stories ... we'd need centuries to hear them. I'm sure you felt that you were alone on the planet while out on the edge to take this photo. Thank you for the memories! @Judy aka L@dybug: A really nice thing to say, Judy - thank you so much! @DULCIE: Thanks so very much, Dulcie! i very much like this angle and pov, denny, as it is new to me! it shows the way to otter cliffs from a very different and very appealing perspective! well done, as per usual!!! Beautiful image and capture, Denny! We both like the same places! I love the sun glistening on the water! This is a fabulous POV!!!! Nice rocks and water. Plus, the warm light is super.